An attempt to remake the pretty-looking shambler with no effort to improve the balance of game systems or iron out bugs. Dead Island: Riptide , the maybe-sequel or sort-of-expansionpack to co-op zombie RPG Dead Island, shipwrecks you once again – on a new Dead Island island that looks and plays exactly the same as the last Dead Island island. Its open world tropical sandbox initially seems promising: it's stunningly beautiful, filled with silly weapons with which to slash wandering zombies on your way through its flimsy plot, and it has a new stereotype: an Australian man. Like the last Dead Island, Riptide still has an indescribably convoluted set of menu systems, including ridiculous upgrade prices that charge you $1,000 of in-game currency to upgrade a hammer to a hammer with barbed wire on it. It still has unsatisfying combat, which – particularly in the new Horde Mode – is reminiscent of attempting to fight off some wet pillows with a child's beach spade. The required sense of peril just isn't there. Instead, your hopes for satisfaction are reliant on levelling up your beleaguered survivor, but it's a simple game mechanic that many RPGs do better – and the prowess of a well-oiled spreadsheet is not enough to trudge through this overglamoured Butlins. 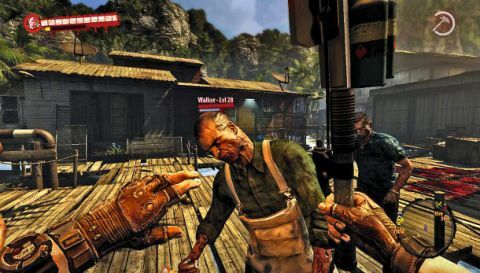 Even with the company of friends squealing in your ear, there's little joy to be found doing the lacklustre fetch quests or clear-out missions, and there's no extra benefit to co-op other than it's easier to beat someone to death if you're in the Shaun of the Dead pool cue formation. "There's little joy to be found doing the lacklustre fetch quests or clear-out missions." As far as Riptide's vnew additions go, the only feature that makes a difference to play is the ability to captain a motorboat. Puttering around paradise on another confusingly signposted 'collect that', 'look there', 'say hi' mission, it's more likely you'll be swamped by zombies and endure quicktime event after quicktime event to fling them off. This is funny the first time it happens, but water eventually feels like treacle and you just want to get to get to the next schlocky cutscene before you explode like one of the bloated Suicider zombies. In Dawn of the Dead the spectre of mindless consumerism is decrepitly embodied by the zombie. I'd warn you in this case not to become that lumbering beast. If this had been released before Dead Rising or Left 4 Dead, or indeed any of the hundreds of zombie games released between then and now, it might still be relevant to your wallet. As it's the reanimated corpse of a previous game that already looked a little peaky, it's something that even Dead Island fans should avoid. Or at least, I'm holding out for a dismembered man-crotch-in-Speedos statue.